The Allen Women Deluxe 46" Rifle Case is the perfect compliment to a collection. 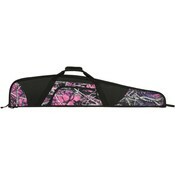 It comes in a stylish and desirable camo accent design and protects rifles and looks good. Its dimensions allow for a full sized gun along with a scope to fit inside. The Allen rifle case is built for comfort and features padded handles for easy carry, along with multiple pockets to hold all of your accessories. Heavy-duty self healing zippers provide added protection and security. On the inside of the Muddy Girl Camo Accents padded rifle case, you will find high-density foam padding that cushions the rifle and affords extra protection during transportation. Its inside lining is easy to clean, so you can keep your case looking pristine and operating optimally.